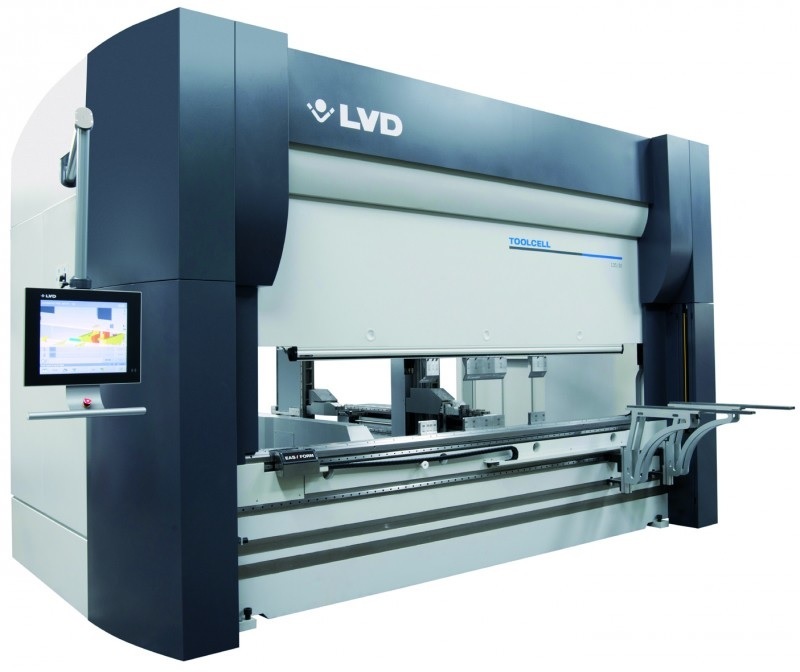 A new 220 ton hydraulic press brake equipped with an automatic tool changer, known as the ToolCell 220/40, was recently introduced by the LVD Strippit firm. Previous ToolCell press brakes manufactured by the company up until now have offered superior metal bending operations, but have been limited only by capacity. Older models had as little as an 80 ton capacity; the newest ToolCell 220/40 model was manufactured with a much larger capacity of 220 tons and offers 160” bending length. 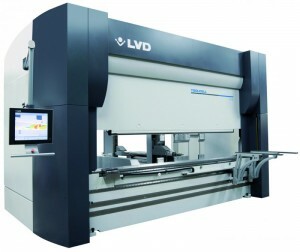 The 220 Ton press brake is designed for small to medium batch production. Set up time is reduced and metal bending efficiency is maximized with its equipped automatic tool changer and tooling storage system. Tools are automatically and precisely placed with the ToolCell 220/40 automatic tool changing technology; eliminating the need for manual adjustments of tooling. Automatic unloading of previously used tool setup and loading of tool setup for the next process. Tooling capacity of two rows of punches on top and five rows of Vee dies on bottom. 220 Ton maximum bending capacity. 160 inch bending length capacity. Rigid frame with hydraulic and electronic real time angle control to ensure accuracy. LVD’s patented Easy-Form® Laser ensures accuracy and consistency of every part with its auto correction and angle measuring technology. 19-inch touch screen control panel known as the Touch-B. CADMAN-OEE PC-based Windows® compatible process management software. The Touch-B control panel can control all parameters of the machine via graphic icons. This machine tool can also be programmed offline using the CADMAN®-B Tool Changer module. Configurable machine options include adjustable stroke, open height front supports and sheet following units. The machine can handle metal bending and folding operations with more than six different tool setups per day and handle parts with multiple complex bending points. It also offers extremely accurate tool set placement; tools are always easy to find thanks to the tooling storage and holders. ToolCell press brakes offer everything a sheet metal industrial operation needs to efficiently produce sheet or plate metal parts. The machine operator can be preparing work pieces for the next job to be completed while the machine is automatically setting up the next tooling setup. The LVD Group was founded in 1925 by George Wales. Wales developed a simple spring that proved to overcome stripping difficulties for material blanking operations. They were the first in the punching industry to develop fully guided self-stripping, self-contained tools. Since then, they have expanded to first manufacture a range of different metal fabrication products, then hydraulic press brakes in 1954. Next, they expanded to punch presses and load/ unload systems; they began introducing CNC machinery in the late 70’s. They are now a leading sheet metal machine tools manufacturer based in the U.S.A. and offer their machine tools worldwide. Their offered machinery includes machine tools like turret punches, guillotine shears, laser cutting machines, press brakes and automation systems.